Friday Night Football: Short and Sweet? To Motherwell and part two of the great SPL Friday night football experiment. Pity poor Motherwell. If you want to try something (sort of) new and attract the punters with cheap tickets it's probably essential that you get ninety minutes played. Unfortunately this Friday night project was abbreviated. The right call: there were obviously concerns - and the whiff of burning - developing during the first half. An extended half time hadn't allayed those fears so the authorities made the decision to call a halt. Safety is paramount. We're now in an era where we can largely travel to football stadiums with little fear. As Stuart McCall said last night that hasn't always been the case. Sometimes health and safety decisions are made in our best interests. One major flaw. The lack of a properly functioning tannoy system in the away end left the Hibs fans to draw their own conclusions about what was happening. The sight of the ball boys disappearing down the tunnel and Motherwell fans heading to the exits told us what we needed to know. In a real emergency that might pose a problem. A needless problem that could be easily solved. We were left in the hands of the matchday stewards. A doughty and oft maligned breed, the football steward. But a breed apart nonetheless. For the steward a stern countenance and high visibility apparel takes the place of polite conversation. All of which added to the breakdown in communication that possibly amplified what I gather were some unsavoury scenes as people tried to get their hands on tickets for the rescheduled match. There was much to admire about the way Motherwell approached last night's game but the handling of the abandonment left scope for improvement. This was a squally, miserable night in Lanarkshire. Hibs, led for the first time by new manager Pat Fenlon, looked more determined, kept their shape better and set out to cope in defence and use Ivan Sproule, Leigh Griffiths and Isaiah Osbourne to support Garry O'Connor. It worked. With more positivity evident in the support there was more desire and simple hard work on the pitch. They kept Motherwell pretty much contained and O'Connor was on hand to convert their chance when it came. So far so good. Even the warm up looked more impressive than it has in recent weeks. A glimpse of a new beginning? I'll not get carried away. Yet. Motherwell seemed more hampered by the wind than Hibs and struggled to break through the defence and seemed unsettled by the constant harrying of the scampering Lewis Stevenson and David Wotherspoon. Both teams though will have been disappointed to be denied a second half. And what of this Friday night frenzy? The ten and five pound admission prices and various other schemes Motherwell had in place apparently did the job. Over 7000 braved the cold to take in the game. That compares nicely with the 5172 and 4202 who turned up for Hibs' two visits to Fir Park last season. As far as I can tell it's the first time this fixture has attracted over 7000 supporters since October 2007. The prices clearly offered a motivation to attend but Motherwell will need to decide if they brought in big enough numbers to make it an experiment that should be repeated. The travelling support of 1500 proved that Edinburgh to Motherwell is not too far to travel on a Friday evening. But that number was surely inflated by the Fenlon factor. Anecdotally a lot of people seemed to suggest that they much preferred making the trip on a Friday evening than, say, for a 12.15 kick off on a Sunday afternoon. But Friday night football was never going to slay the television scheduling monster. We can say that Aberdeen v Dunfermline and Motherwell v Hibs have drawn over 15,000 fans for the two Friday night games. If the clubs consider that to be a success then they have to announce a longer term experiment. I don't think ad-hoc games, particularly with the massive variable of Motherwell's pricing ploy, can give us a decent guide as to the longer term sustainability of Friday night football. Persuading Sky or ESPN to schedule some Friday night TV games - whispers suggest this might be in the offing - would also give a better idea of how Friday night compares to Saturday or Sunday lunchtime. There might be a germ of a good idea here. And there's probably enough evidence to suggest that it is worth exploring more. But two games do not a nation of Friday night converts make. Lower prices = bigger crowds. That might just be more important than when you kick off. Pat Fenlon finds himself in the Hibernian trenches for the first time this evening. Another SPL Friday night experiment as Hibs take a trip to Motherwell. Perhaps I'm guilty of misreading his intent but my impression was that Henry McLeish had suggested Friday night football as a way of reinvigorating the lower leagues. But the SPL seem to have claimed it as their own. And Motherwelll, ticket prices dropped and curry offers abounding, are clearly keen that tonight is a success. First though, a look at a couple of Hibs' more recent Friday night games. Celtic in a Scottish Cup semi final at Ibrox. On a Friday night. That would not happen today. I don't know if that's a reflection of regression across society or increased sophistication in policing methods. Either way it seems this is one Friday night experiment that we will not see again. 40,950 trooped to Govan to see this stalemate. Celtic had a chance to win it when Pat McGinlay fouled Paul McStay outside the penalty box. A foul that led referee John Robwbotham to award a penalty kick. Andy Walker took the kick, Jim Leighton made the save and justice was done. In truth Celtic had dominated but a doughty Hibs defence kept the fixture alive. I've got a feeling that Graham Mitchell ended this game with his head swathed in hastily applied bandages. It was that sort of night: bravery and commitment above flair and attacking football for Hibs. The following day Airdrie beat Hearts in the other semi final. The next Tuesday Hibs and Celtic were at Ibrox again. Celtic won that one 3-1 and went on to beat Airdrie in the final. Celtic: Bonner, Boyd, McKinlay, Vata, O'Neil, Grant, McLaughlin, McStay, Van Hooijdonk (Falconer, 42min), Walker, Collins. In 1996 the Scottish Premier Division still enjoyed occasional occupancy of Sky's much coveted Friday evening slot. So it was that almost 11,000 fans filled into Rugby Park to see new signing John Hughes make his debut for Hibs. Hughes was signed by Jocky Scott, then navigating his way through an underwhelming stint as caretaker manager following the departure of Alex Miller. Hibs had suffered a 4-0 tonking against Celtic before this one and were no doubt looking to Hughes to fill some gaping defensive holes. He didn't quite manage it. An up and coming young midfield maestro was also in the Hibs team. A chap called Ray Wilkins. John Henry, Jim McIntyre and former Hibs player Paul Wright did the damage for Kilmarnock. Andy Dow and Kevin Harper got the goals for Hibs. This tranche of Friday night game actually began for Hibs back in January 1995. Oddly enough on Friday the 13th. Fir Park was again the destination. It finished 0-0 in front of 6724 supporters. So there we have it, the SPL's brand new Friday night experiment is not that new. And so far, for Hibs at least, not that successful. 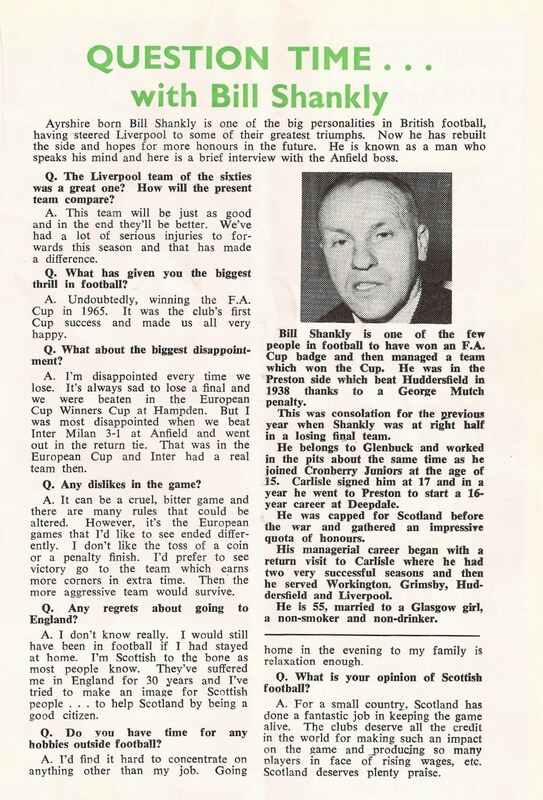 When I was writing about the evolution of the football programme a few weeks ago I mentioned a Hibs v Liverpool Fairs Cup programme from December 1970 that carried an interview with Bill Shankly. I can't remember seeing an interview with a visiting manager in a programme before. Ayrshire born Bill Shankly is one of the big personalities in British football, having steered Liverpool to some of their greatest triumphs. Now he has rebuilt the side and hopes for more honours in the future. He is known as a man who speaks his mind and here is a brief interview with the Anfield boss. Q. The Liverpool team of the sixties was a great one? How will the present team compare? A. This team will be just as good and in the end they'll be better. We've had a lot of serious injuries to forwards this season and that has made a difference. Q. What has given you the biggest thrill in football? A. Undoubtedly, winning the FA Cup in 1965. It was the club's first Cup success and made us all very happy. Q. What about the biggest disappointment? A. I'm disappointed every time we lose. It's always sad to lose a final and we were beaten in the European Cup Winners Cup at Hampden. But I was most disappointed when we beat Inter Milan 3-1 at Anfield and went out in the return tie. That was in the European Cup and Inter had a real team then. Q. Any dislikes in the game? A. It can be a cruel, bitter game and there are many rules that could be altered. However, it's the European games that I'd like to see ended differently. I don't like the toss of a coin or a penalty finish. I'd prefer to see victory go to the team which earns more corners in extra time. Then the more aggressive team would survive. Q. Any regrets about going to England? A. I don't know really. I would still have been in football if I had stayed at home. I'm Scottish to the bone as most people know. They've suffered me in England for 30 years and I've tried to make an image for Scottish people...to help Scotland by being a good citizen. Q. Do you have time for any hobbies outside football? A. I'd find it hard to concentrate on anything other than my job. Going home in the evening to my family is relaxation enough. Q. What is your opinion of Scottish football? A. For a small country, Scotland has done a fantastic job in keeping the game alive. The clubs deserve all the credit in the world for making such an impact on the game and producing so many players in [the] face of rising wages etc. Scotland deserves plenty praise. 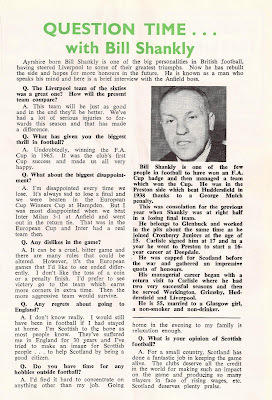 Bill Shankly is one of the few people in football to have won an FA Cup badge and then managed a team which won the Cup. He was in the Preston side which beat Huddersfield in 1938 thanks to a George March penalty. This was consolation for the previous year when Shankly was at right half in a losing final team. He belongs to Glenbuck and worked in the pits about the same time as he joined Cronberry Juniors at the age of 15. Carlisle signed him at 17 and in a year he went to Preston to start a 16 year career at Deepdale. He was capped for Scotland before the war and gathered an impressive quota of honours. His managerial career began with a return visit to Carlisle where he had two very successful seasons and then he served Workington, Grimsby, Huddersfield and Liverpool. He is 55, married to a Glasgow girl, a non-smoker and non-drinker. > Liverpool won the game 1-0 with a second half goal from John Toshack. In the second leg goals from Steve Heighway and Phil Boersma completed a 3-0 aggregate win. Liverpool went on to beat Bayern Munich 4-1 in the quarter final before losing to eventual winners Leeds in the semi final.